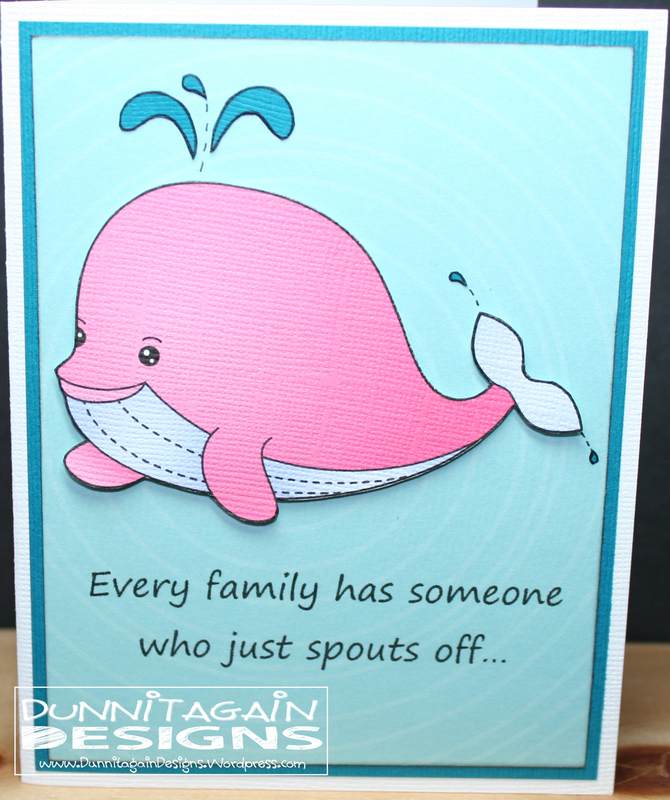 Here is my last card as the Guest DT member for Deedee’s Digis! What a month it has been! I have so enjoyed working with the stamps but more importantly I have gained a closer relationship to my friend, Deedee. I have enjoyed talking to her about events in her life and mine….I just got promoted at my job!! In all of this God has led me to use my organizational skills to help Deedee with her business by becoming the Sponsorship Coordinator for Deedee’s Digis! So I get to stay on her team!! It is hard running a business and family all by yourself…so I see it as a win/win for both of us. I won’t be creating on a regular schedule but you know I will be using these adorable images any chance I get. Hopefully you will come play with us in some of the challenges Deedee’s Digis sponsors and you will have a chance of winning a $10.00 gift code to the store!! Check out the side bar on Deedee’s blog for upcoming challenges. A current challenge Deedee’s Digis is sponsoring is Sketch Saturday Challenge #328. You have until Friday to enter the challenge so come over and play with us!! 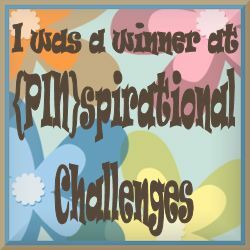 She is also sponsoring Incy Wincy Designs Challenge – ANYTHING GOES!! Do what I did and make one card and enter it in both challenges to double your chance at winning a Gift Code to Deedee’s Digis! 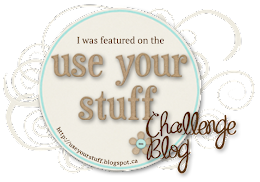 1) Come and Get It Challenge – Use 3 of something. I have 3 stars, 3 pieces of polka dot paper. 2) Crafts 4 Eternity Challenge #194 – My Style. This week we would like you to share projects which show your signature style of crafting. My style is simple with lots of layers. I’m pretty linear in design with not a lot of fluff. So my neighbor/friend’s birthday was the 11th and I knew she liked the color blue, Disney, nature and flowers. 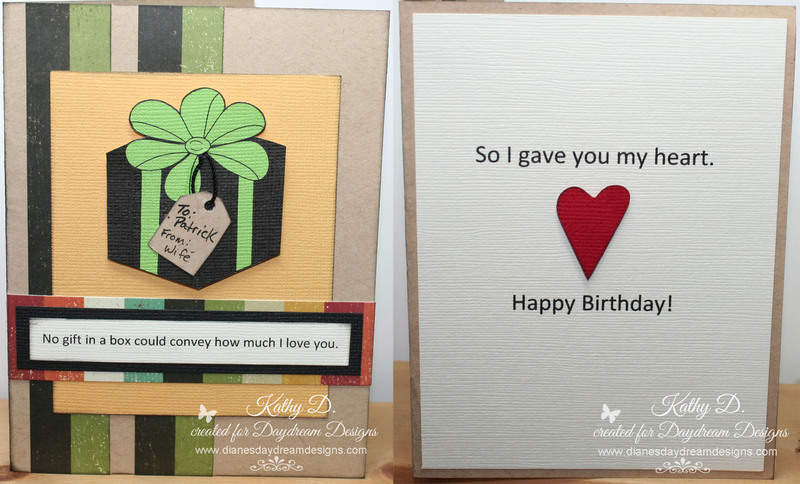 So I designed this card with that in mind….she liked it!! 3) Love to Create Challenge #133 – Add some lines. Wasn’t a 100% sure what this meant but I figured lines in the paper, the paper in a line, stitching in a line would qualify…if not then let me know and I will withdraw. 5) Seize the Birthday – Create a birthday project with or without the topping. The topping was Sweet Treats. I did it without the topping. Oh my goodness Deedee is the coolest person to be a guest designer for!! She made this stamp just because I requested it!! A friend of mine, Dale, just had open heart surgery a couple weeks ago. His sister, Beverly, is also a friend of mine. A couple years ago she told me what the “sisters” nickname was for Dale when he was little…Dale the Pink Whale with a Purple Tail!! So I thought that would make a cute Get Well card for him. I asked Deedee if she had a whale in her stash and she said she didn’t but drew this up in no time! It was perfect…she even made a pink with purple tail version!! This is the card I made for the “sisters” to give to Dale. Inside: …But not everyone has a Dale the Pink Whale with a Purple Tail! Glad you’re back to spouting off and feeling better. Dale is ornery and that is probably why he was out of the hospital in less than a week! So this quote that my friend, Stephanie, and I came up with is perfect. The sisters loved it and Dale thought it was pretty cool that it was made just for him. And it was funny because after open heart surgery he has a purple tail from all the bruising! 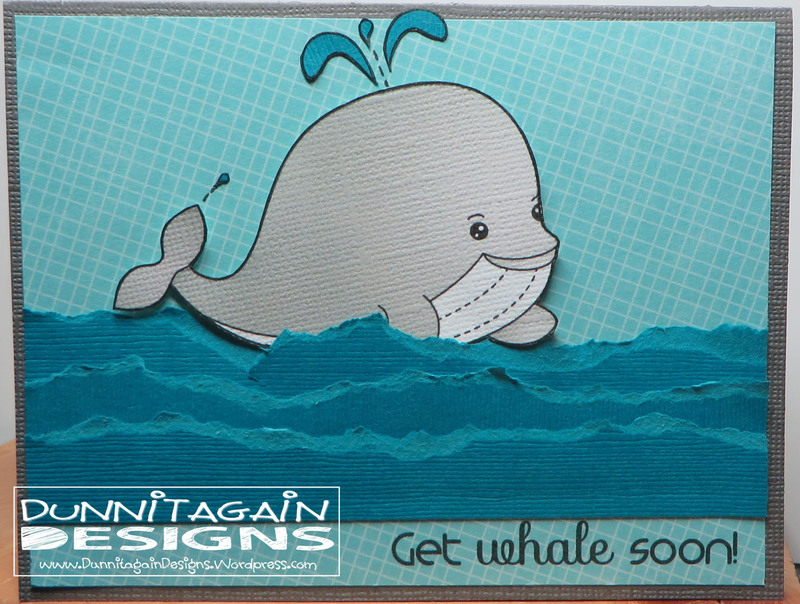 I let the circles in the patterned paper act as the water so I could keep the card simple to keep the focus on the whale. I used Sketch Saturday Sketch #326 as my inspiration. 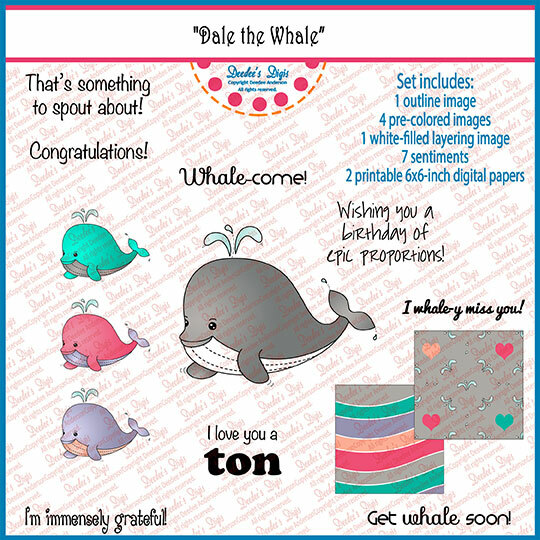 Then to show how fun this digital stamp is I made a generic Get Whale …I mean Get Well card! Both the cards turned out to be CAS cards which is funny because I usually don’t do that style very well. But I like how these turned out! I used Sketch Saturday Sketch #287 as my inspiration. 3) Digi Sketch Challenge – Get Well – Use the sketch or the theme or both. I used the theme. 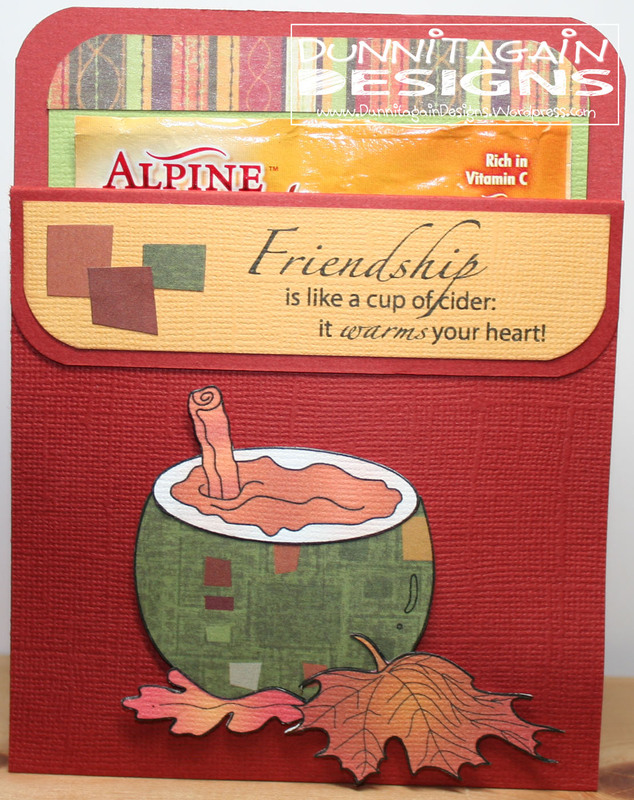 When I first saw this digital stamp I loved the Friendship quote because it is so true! Last year friends of ours brought over Apple Cider to one of our marriage groups and my husband loved it! So it reminded me of our dear friends that shared their apple cider. I thought it would make a cute gift to package it and have that saying on there. That is how this pocket card gift came about. I used the Pocket Card Tutorial on Splitcoaststampers. 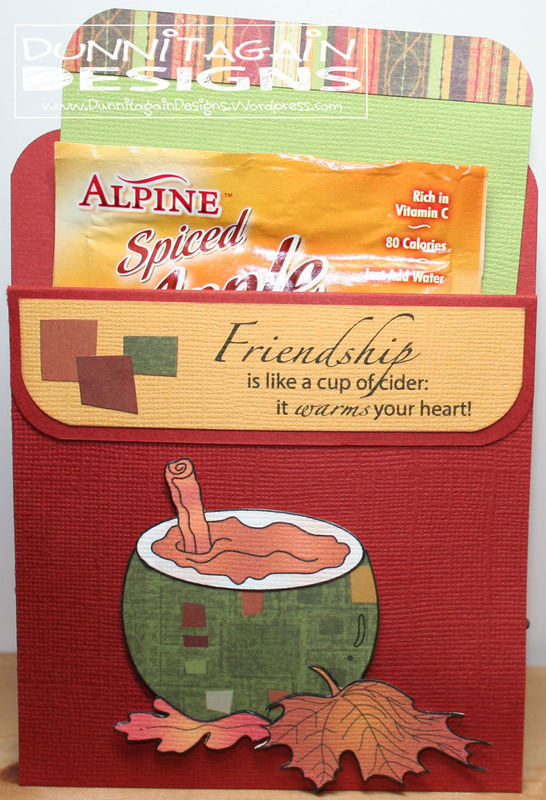 I include the paper slip along with the packet of cider so a note could be written to the recipient (see 2nd photo). And yes that is the yummy cider packet my husband now loves! I decided instead of the apple I would turn mine into a cup. I printed out the outline image on patterned paper and cut the “cup” out. Then I printed the colored version of image and cut the cider and the leaves out. I glued them together to get the completed look. I made this for my husband yesterday because it was his birthday. I had been trying to figure out what I was going to make because I like it to be personal and made especially for him. As I went to bed Friday night this ideal popped in my head. My friend helped me tweak the sentiment so it sounded right. 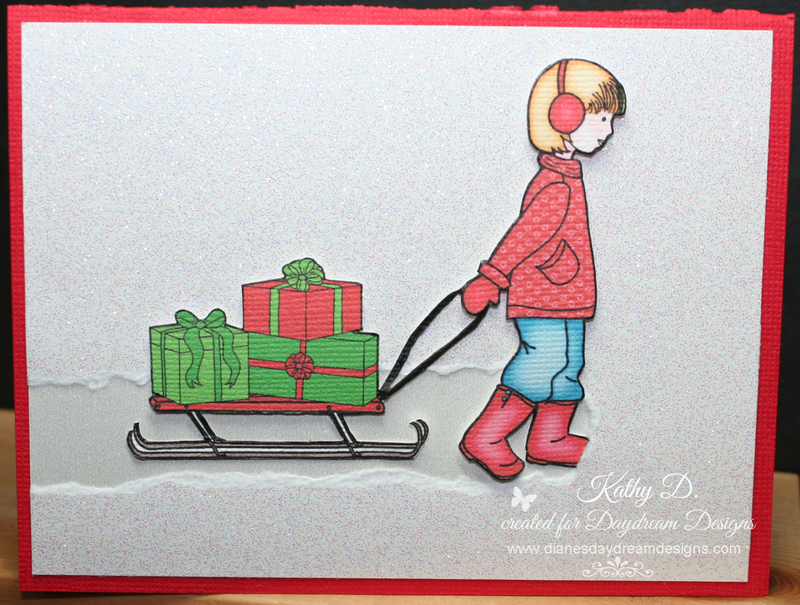 I used a present image from a Christmas digi stamp, Wrapped in Cheer Outlines, at Diane’s Daydream Designs. The colors I picked to use are for my husband as he likes darker shades with black being his favorite. The green on the bow didn’t turn out as dark as I wanted but didn’t notice till I was sticking it on the card so I left it. 2) Squigglefly Challenge #36 – Stripes. 3) Aud Sentiments Challenge #115 – For the men in our life. Pulling presents through the snow! So I was struggling with the sketches in the Sept Card Sketch Challenge as they were not coming to me. I’m not a CAS card person so I was struggling this month. While I was waking up Wednesday morning this ideal came to me for Sketch #2. Instead of a banner I ripped the paper and instead of the stars I put an image there. This card ended up being CAS and I love it. I used sparkle paper from Doodlebug to represent snow and shiny paper underneath to represent the compressed snow! Hope it makes sense as to the scene I was setting! I used the outline and colored versions of this digital stamp. I wanted presents on the sleigh but the colored version had them in pink and black and that wasn’t working for my Christmas card. I used the outline version and colored the presents in Photoshop. The girl was beautiful dressed for Christmas in one of the pre-colored images so I just cut her out and glued her on top of the outline version! 2) Christmas Card Challenges #41 – Think Skinny. The path in the snow is skinny! 4) Merry Monday Christmas Challenge #125 – Transportation. Use some type of vehicle or transportation on your Christmas card. I used a sled. OMG does anyone else even have their Making Memories tag maker anymore!! When I started playing with sketch #4 in the Sept Card Sketch Challenge I thought making the circles tags helped them pop more off the patterned paper so that is how this OLD TOOL got dusted off! 5) Papertake Weekly Challenge – Repeat Repeat. all we want you to do is to use a repeat design of some description. This could be text, a flower or die, gems etc. The pencils are repeated in the design paper, the strips of paper on the right are repeated and tags are repeated. 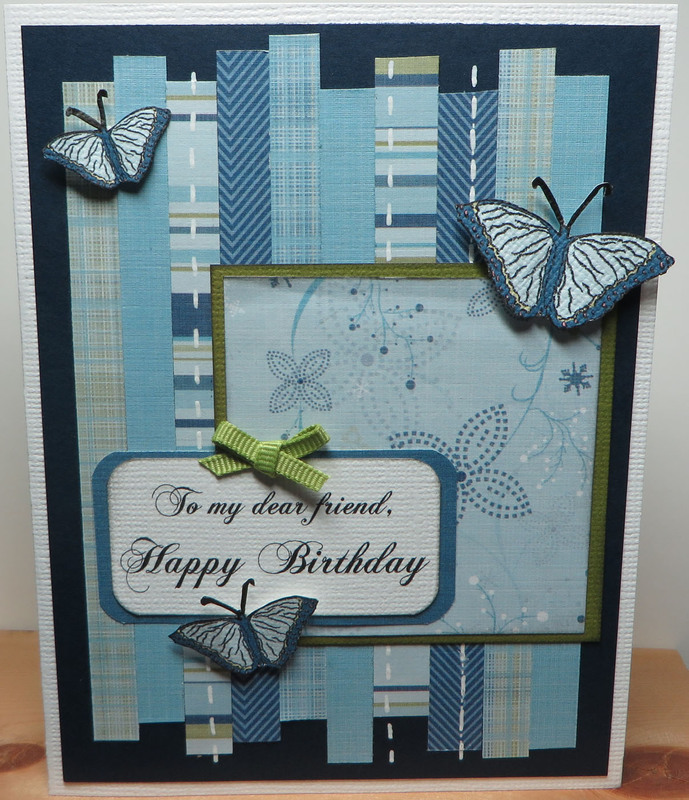 Patterned Paper: design come in the digital stamp and then I printed it on Bazzill White cardstock.